Lately, I’ve been doing some audio recording. In addition to a couple of podcasts that I work on, I occasionally like to record my own musical compositions. While there seems to be no shortage of high-end audio editing applications on either Windows or Mac, the situation on Linux is a bit more sparse. Faced with some frustration, I went out and downloaded a number of linux-based audio editors. I used Wikipedia to find the software in the tests below, and following are my totally subjective and highly biased reviews of each. Each piece of software was used to edit some raw recordings from a podcast that I have been involved with lately. This source material is almost 100% spoken word, with some music and sound effects sprinkled throughout. It’s important to note these details, as your needs may vary drastically depending on the type of audio project that you’re working on. 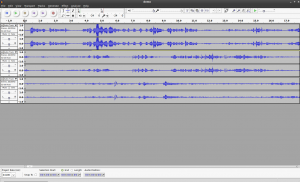 The Audacity Project is kind of the Linux standard for non-professional audio editing. It was the first application that I tried to use, mainly because I was familiar with earlier versions of the program that I had once used back in my Windows days. Audacity includes a great number of features that make it ideal for post-processing of any audio project, including a wide array of effects, some great noise generators, and a few analysis tools that make it perfect for cleaning up your finished file before publication. Unfortunately, I found that it lacked a usable GUI for editing podcast material. In particular, it seems to be missing the ability to edit a single track in a multi-track project without unduly affecting the other tracks.By default, if you use the selection tool to grab a portion of audio that ought to be deleted from one track in the project, it seems to delete that portion of audio from all tracks in the project. I found this out the hard way when I played back the master track that I had assembled my finished podcast on, only to find out that significant portions of the audio had mysteriously gone missing at some point during the editing process. To make matters worse, I closed the application, lost the undo record for the project, and had to start the editing process from the beginning. This lack of GUI polish also exhibits itself in the way that you can interact with the audio tracks themselves. Unlike in most DAW solutions, a portion of audio that has been clipped out of a larger track cannot seemingly be moved around in the project by clicking on it and dragging it across the stage with the mouse. At least I couldn’t figure out how to do it, and ended up relying heavily on my cut, copy, and paste functions to edit my project. This is a poor way to work on a project of any kind of complexity, and makes projects that rely on audio loops a pain to assemble. Where Audacity is suited more towards hobbyist recording setups, Ardour aims to be a professional audio solution that is capable of competing with mainstream software like ProTools. It is a fully featured audio suite that can allegedly do most everything that you may require, but as such, can also confuse the hell out of first-time users with its complicated GUI and lengthy manual. show. If you just want to edit a podcast, it may not be the tool for you. As such, if the GUI seems challenging and you find the documentation to be long-winded, you may just be using the wrong tool for the job. The biggest issue that I had with this piece of software was getting it to run at all on my machine. It uses JACK to attach itself to your audio interfaces in the name of providing a perfect sampling environment that doesn’t get slowed down by having to share the interface with other pieces of software. Unfortunately, this means that in order to use it, I had to quit all other processes that are capable of generating sound, including this web browser. This is a pain if you are trying to run Ardour in a multi-application environment, or need to reference the internet for anything while working. After reading the introductory documentation and adjusting the settings in the startup dialog for about 15 minutes, I simply gave up on Ardour without ever managing to get into a workspace. It seems to be far too complicated for my needs, and doesn’t seem worth my time. Your mileage may vary. created by a podcaster who was unsatisfied with the audio editing tools that were available on Linux. The application focuses on being easy enough to use that non-technical people like musicians can pick it up and get their ideas down with minimal hassle. Think of it as Garage Band for Linux. Indeed, just as the website promised, I was able to get a working environment set up in a matter of minutes. 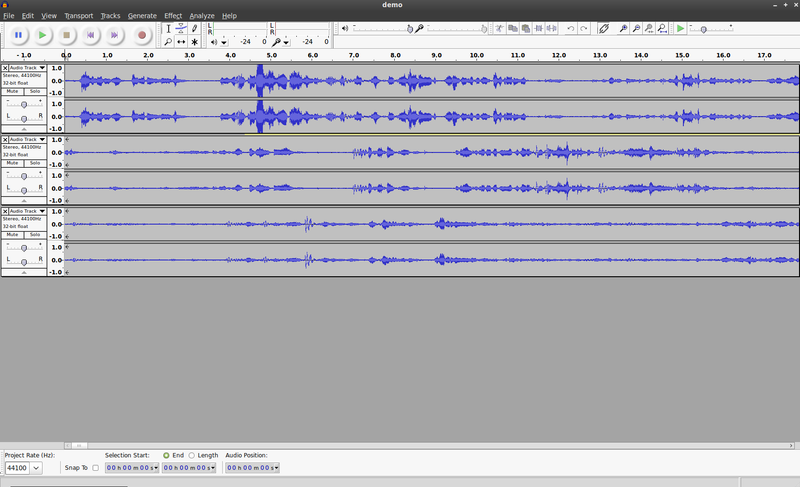 The editing tools allow for splitting the audio, grabbing it and moving it around, and non-destructively editing multiple tracks at the same time (I’m looking at you, Audacity). The GUI also has a beautiful polish to it that, although a tad cartoony, really makes the program look and feel simple. For editing something like a podcast, I’m not sure that this application can be beat. The only issue that I encountered in my short time using Jokosher was with its support of LADSPA plugins. These are free audio plugins that can be used to apply effects to the different tracks of your audio project. When I tried to use them from within the application, it instructed me to download some from my repositories. Upon checking Synaptic, I saw that I already had a number of them downloaded. Even after installing more, the program did not seem to pick them up. All in all, this project lived up to its hype, and I will most certainly take some time to break it in, and may write a more in-depth review once I get used to it. If you’re doing podcasting, you owe it to yourself to check this app out. Each of the three applications that I tried to work with while writing this piece deserve your respect. The underlying audio framework of most Linux systems is a veritable rats’ nest of subsystems, platforms, daemons, plugins and helper applications. I would wager a significant amount of money on this situation as the reason that we don’t have ProTools and its ilk on our platform of choice. I’ve done a little bit of work with GStreamer, and even it, as perhaps the prettiest and best supported of all audio libraries on the platform, left me scratching my head at times. When choosing audio software, it’s important to keep in mind that you need a tool that’s uniquely suited to your project. Since I’m editing podcasts and fooling around with drum loops and samples of my guitars, Jokosher does just about everything that I need and more. I may use Audacity for post-production, or to record my source audio (simply because I haven’t tried recording in Jokosher yet – I know that Audacity works), because it falls somewhere in between a simple editing tool and an advanced platform. Ardour, meanwhile, is probably suited towards the more hard-core audio engineer slash system administrator types who are so fanatic about recording quality that they are willing to sacrifice an entire box for running their DAW software. It’s simply more power than the majority of hobbyist enthusiasts really needs. Jokosher is pretty great. I used it briefly a while back and it just… makes sense. There’s no other way to really put it. I highly recommend casual users give it a shot. Chances are what you were missing for ladspa support was the gstreamer0.10-plugins-bad package as this contains the gstreamer ladspa element used by Jokosher to access the ladspa plugins installed on your system. I hope this helps with ladspa problem: http://tim.freunds.net/blog/articles/ladspa_and_jokosher.html. 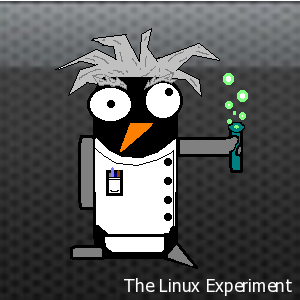 I do it on Ubuntu Lucid Lynx and it works. It seems like you don’t quite understand what JACK does or what it is for. Chances are, you’re using PulseAudio, which doesn’t really play nice with JACK at the moment. If you must use Pulse, you should install the JACK modules for Pulse. JACK does not monopolize your hardware in the way you think it does, nor does Ardour require complete control over your audio hardware. As a matter of fact, JACK exists to share audio (and now MIDI) data between applications that support it. That being said, you’re probably right that it’s probably more complicated than what you actually need. Just understand that problem you were having is likely due to the way Pulseaudio is set up, not due to JACK or Ardour itself. Your problem with Audacity editing all tracks at once is because you have “link tracks” enabled. Just click the toggle button that looks like chain links to disable track linking, and then you can edit each track individually. Thanks for all the tips guys, I really appreciate your help! Different tools for different jobs. I use Audacity primarily as an editor/post production tool. It does a better job than anything out there cheap/free at time compress, and the ability to split stereo pairs comes in handy for a certain program that arrives every week for broadcast recorded in stereo with only the left channel active. But you haven’t lived until you use a DOS based editor on a professional basis every day. Nothing like hitting F4 repeatedly after adding 10 seconds to the start time of the desired segment from the number pad. Then hitting F3 to hear the last 3 seconds after determining where the segment ends. You can see the waveform, but not play it from that screen. Actually, once you learn and use it for 10 years, it’s faster than anything else out there for certain tasks ( like chopping a football call into a highlight). I was forced to use Audacity for 2 weeks for this task, and it sucked compared to f3/f4, scribble on a notepad when the highlight started.